Those of you who know me in person probably know I'm obsessed with rose-flavored and -scented products. Rose syrup, rosewater, rose tea, rose candles, rose ice cream...you name it! But, rosewater happens to be a wonderful addition to skin care products, and a great toner in its own right. I use a rosewater toner once or twice a day after cleansing. It's the very gentlest of astringents, so it's perfect for sensitive skin. Rose is also known to be beneficial for mature skin. It's softening, soothing, and smells like heaven. You can see in the picture I also have a bottle of rosewater and glycerin, which is perfect if you have dry skin or live in a dry climate, since glycerin keeps some moisture in your skin. You can use it to refresh your face during the day if it's feeling dry, without messing up your makeup. I'm currently using a Heritage brand rosewater, but there's tons to choose from. A good and cheap option is to buy rosewater from a Middle Eastern grocery store if you have one nearby (like in the picture). Many other stores will also have an ethnic foods aisle you can check out. 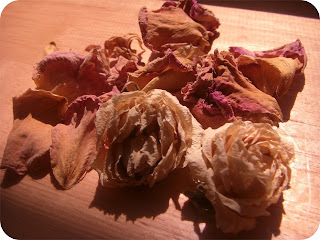 A bag of dried rose petals I purchased, and some more from the garden. 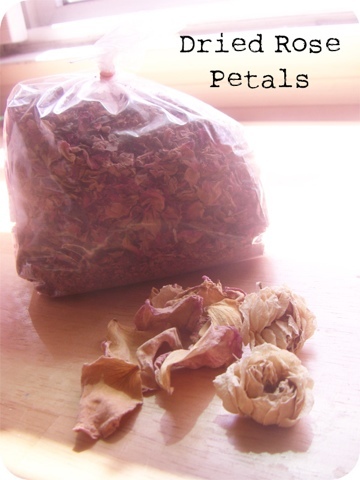 What's even more fun, is it's very easy to make your own rosewater out of dried rose petals. You can order some online from somewhere like Mountain Rose Herbs, or use roses from your own garden (you'll need a lot!). If you are the DIY type, floral waters--rose or otherwise--are nice to use in place of distilled waters in toners, lotions, masks, scrubs, or anything really. Or if you have a prepackaged product that needs to be mixed with water, like a clay mask, you can easily use rosewater instead for extra softening power. And of course there's always rose absolute essential oil, but it'll cost you. It takes something like 10,000 pounds of rose blossoms to create 1 ounce of essential oil. So it's pretty expensive! 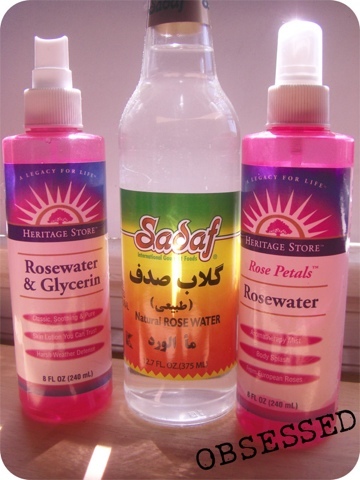 Last, but not least, rosewater and rosewater with glycerin are great makeup setting sprays! The kind with added glycerin works best for refreshing your makeup and helping it stay a tiny bit longer. Neither of these are going to work as well as something like Urban Decay All-Nighter, but they do pretty well. And they're good for your skin! My favorite method is to spray some rosewater on my face after my makeup is done, especially if I've been using powders, just to make it look less matte and more natural. And it smells amazing! Can you see why I'm obsessed?